Klagge, J. (2011). Wittgenstein in exile. Cambridge. Cambridge, MA: MIT Press. To sum up, Hans Sluga once wrote that “human language games are not based on knowledge but on practice.” (Sluga, 2011, pg 107) I have applied this observation to the broad notion of existence or practice. It is not what we know that gives shape to our existence. It is what we do. Our knowledge comes to serve and - in fact - justify why we do what we do and the standards of excellence that we expect from these endeavours. If I am to conclude, then I would say that a practice is something that we do not just once but on a regular basis. Unlike an activity, the participant in a practice attaches a certain level of significance or commitment to the action. In the practice, one comes to acquire certain rules that give shape to the practice. The participant comes to act in accordance with the rules, some which are explicitly stated and others which are acquired through experience and understood as conventions of the practice. To be fully immersed in a practice requires an understanding of the standards and expectations, the intention behind the activities, and the motivation and significance that underpins the practice. One becomes adept in the practice through experience, and this is assisted through instruction (or guidance) by those who are more experienced. These “masters” set the stage for engagement and they scaffold subsequent engagement and development. This is done in the hope that the practice will be internalised and the participant will “go on” in accordance with the rule. By “going on”, the learner is committed to the practice by adhering to the practice, contributing to the practice and being part of the practice’s evolution. Collectively, one’s practices give shape to one’s form of life within the stream of living. One’s practices provide one with a habitus (or culture), and one’s habitus (or culture) gives rise from one’s practices. At the same time, we should never forget any single practice or set of practices is open to disintegration or entropy. Entropy is formally defined as "the lack of order or predictability; gradual decline into disorder." Any system must have energy placed into it so that the system is maintained or preserved. If the practices of a cultural system are not reinforced, then the system and the form of life to which that system is attached will suffer and decay. According to the concept of entropy, the natural state of any system is decay unless efforts are made to maintain it. Doubt, suspicion, hesitancy - these are key qualities of a type of intellectual skepticism. The knowledge that there may be another possible action or form of life or explanation makes any idea or practice or commitment appear arbitrary. To abide by any set of propositions is to marginalise another set of practices, until the skeptical mind intervenes to shut down any commitment to ideals at all. Placed in a political space in which there is cultural diversity, a skeptic would be loathe to claim any privileged position of one set of ideas over another. This is the personal struggle with skepticism that people are engaged in. It begins with the question, "how would I be able to commit?" 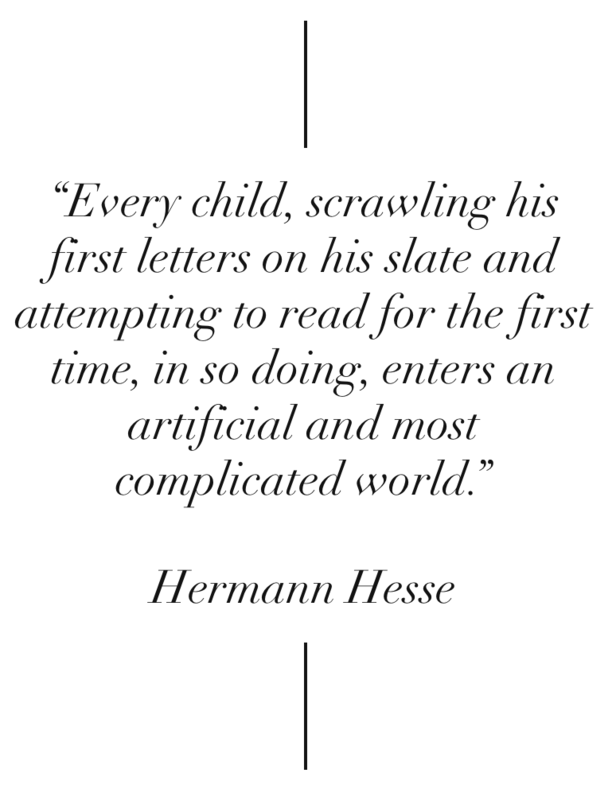 It is not particularly novel to say that reading is a process that involves decoding, meaning making and interpretation (or assessment). It is also quite straightforward to say that this sequence occurs within a context in which factors such as the immediate purpose, expectations and other participants affect how and why one reads. The sequence is represented in the following diagram (with further commentary to follow). 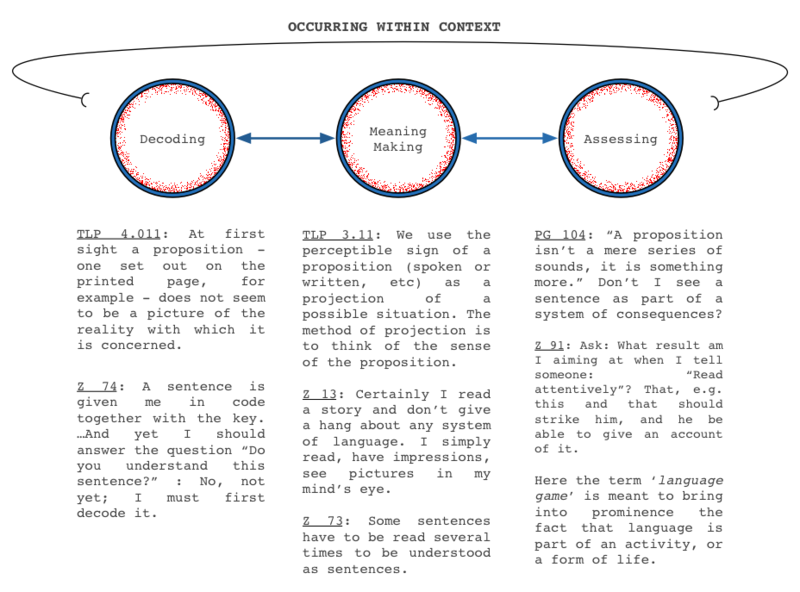 In Wittgensteinian terms, the reader progresses from aspect seeing (decoding) to meaning making (picture theory) to assessing (language games). The reader sees the text, gathers some sense from the text and extracts some meaning from the text as part of overarching conversations and conventions. I will need to be part of the greater conversation ( of the language-game ) of which the text is part. What if it was not a newspaper article but an economic text? I would be at a loss even though I may have sophisticated decoding skills and robust general comprehension practices. My exclusion from general conversations of economics demonstrates that the above process works just was well in the reverse. That is, if I am aware of the "conversation" to which the text belongs and I understand the intention of the reader-writing exchange, then I am in a better position to know what may and may not be significant in the text, even I may need some help. I may be able to read more strategically and I am also in a better position to clarify ambiguities in the text because I have prior experience and knowledge to call upon when I am stuck by particularly dense or awkward phrasings. assessing --> extract significance, apply ideas, understand intentions, respond and react, summarise and synthesise, etc. participating --> being part of knowledge communities and practices in which it may be necessary to consult a text in order to take part. One can regularly find glaring differences between the have's and have-not's, particularly when structural factors in society serve to perpetuate the differing outcomes for members of the community. I say this in reflection to a specific place and to specific people. It is a place to which I travel often, and the observations made here are observations which I have made previously. Yet I have never quite conceptualised it in writing in the way that I am attempting to do now. I am writing about a place in the centre of Australia. For those who are curious, it is not Alice Springs. It is a sizeable town for the Northern Territory. Many forms of life are lived. Some with material comforts. Many without. There is a deep Aboriginal history in the region as well as a more recent non-Aboriginal presence. To be more specific, I find myself at the local primary school in the town. Like many schools, the yard at recess is a space of chaos, screams, chattering and climbing. The school population is diverse, which is reflected by the students of Anglo, Asian, and Aboriginal backgrounds. Buildings are colourful as are the classrooms. Inside a particular classroom, I see the divide between those who live in literacy and technology-rich environments and those whose access to books is severely limited outside of school. Those from literacy-rich homes benefit from experiences that are consistent with the content and ways of learning to be found in the typical Australian classroom. The types of investigations and the routines of learning are consistent between school and home contexts. Successful students learn the rules, acquire the knowledge, perform the tasks, and imagine future school success. And these students are able to do so with a fair amount of stability and support from family in the home, who often have a strong understanding of what is occurring in the classroom. The fact that some students come to school better placed to succeed is something well documented. The fact that the school curriculum can inadvertently benefit the culture and experiences of certain students over others is also demonstrated by the work of Pierre Bourdieu and Jean-Claude Passeron (1990).